The Short Wave Loads are air cooled dummy loads designed especially for short wave transmitters that can handle ultra high power. 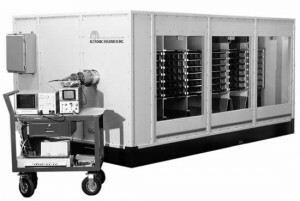 These 50-ohm loads are constructed with the same design techniques as the Ultra High Power Medium Wave Loads providing superior RF characteristics under power. The Short Wave Loads have all the same features as the other air cooled loads such as interlock, thermal overload protection, screened louvered intake and output panels and roof on outdoor units with no tuning required. A plot of our 300kW model 77300SW is shown below.